Treat your skin to beautiful, handcrafted soaps made from the finest olive oil, coconut oil, vegetable oils and healing shea butter, with fragrant herbs and the best quality essential oils - nothing else added--no chemicals or animals products used! 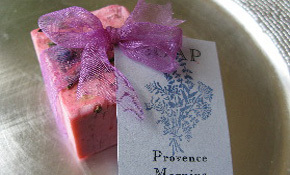 I have been creating luscious skin renewing soaps for years and hope you will use each bar with joy. Every soap is exquisitely wrapped in organza ribbon and adorned with a colorful tag and descriptive story on the reverse side. Our soaps not only look amazing, they are amazing! Enjoy this simple, yet elegant treat from me to you! All of my candles are spiritual and intuitive creations from my vast knowledge of scents and their healing properties. 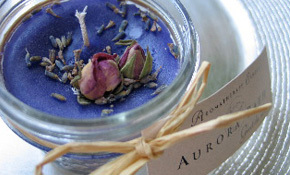 I produce beautifully fragrant candles that are not only long-lasting but healing to the mind, body and spirit. Treat yourself to a wonderful soy combination wax candle, guaranteed to fill a whole room with fragrance and burn between 30 and 50 hours. Each candle is beautifully decorated with flowers and herbs, glitter, shells, you name it (!) and comes with a lid, perfect for travelling. We recommend burning candles only to 1/4" from the bottom of the jar to insure safety. Keep an eye on the flowers/herbs atop the candle, usually they swirl into the wax once the candle is lit. NEVER leave a candle unattended! From fun and funky to bold and chunky, you'll find the hottest new fashion accessories right here!! Historically and in our current rough economic times, , accessories have been touted as the just the remedy for a sagging spirit; a little something you can treat yourself to that will make you and your wardrobe feel better, without breaking the bank! Selected with our interesting, bold, artistic and urban-esque customer in mind, we offer the latest in vogue jewelry, featuring gorgeous resin/shell/rice/wood pieces from Holland and Parisian enamels, based on retro/vintage designs. 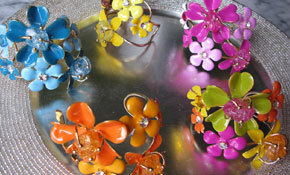 In addition, you'll find a choice selection of headbands, hair accessories and scarves. We will be changing the images often (every 1-3 wks.) so you'll find all the latest accessories right here. It is my hope that you'll come back often and be constantly surprised!